Shop CanadaPharmacyOnline.com and order Climara Patch at the most affordable prices. We currently have the brand Climara Patch from Canada and Turkey manufactured by Bayer. We may sometimes carry the brand also called Femseven from UK manufactured by Merck. The Climara Patch Pro (45mcg/15mcg) comes from Canada and is manufactured by Bayer. The generic Estradiol-17b patch comes from Canada manufactured by Sandoz. Climara Patch is available in the strength of 25mcg, 50mcg, 75mcg and 100mcg patches. Climara Patch (Estradiol Patch) is used to treat certain symptoms of menopause such as hot flashes and vaginal dryness, burning and irritation. These symptoms are caused by the body making less estrogen. 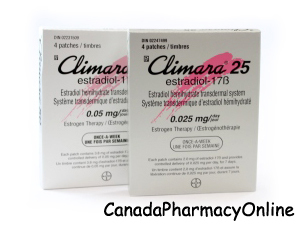 Estradiol patch belongs to the class of medications known as estrogen replacement therapy. When an Estradiol patch is applied to your skin, it releases estradiol into your blood through the skin. This medication may also be used by women who are not able to produce enough estrogen. The standard dose for Climara Patch is one patch once a week. You should not use Climara Pach if you are allergic Estradiol. Before you start using this medication, talk to your doctor about your medical conditions and about all the medications you are currently taking including OTC and herbal medications. You should not use Climara Patch if you are pregnant. Inform your doctor right away if you become pregnant during treatment. The long-term use may also increase your risk of cancer or blood clot. Estradiol can pass into breast milk. Climara may slow breast milk production. Do not use Climara skin patches if you are breast-feeding a baby. 1. How should I use Climara Patch? Answer: A new patch should be applied to your skin on the same day every 7 days. 2. Where should I apply the Climara Patch? Answer: The patch if often applied to the buttocks, lower abdomen, or hip.